When it comes to the Note 10.1, there's a slip in the crowd: you either love it or hate it. Those who do love it, though, really love it – if you'd like to join those ranks but just can't justify dropping five hundred dollars on a tablet, 1 Sale a Day may have your ticket. 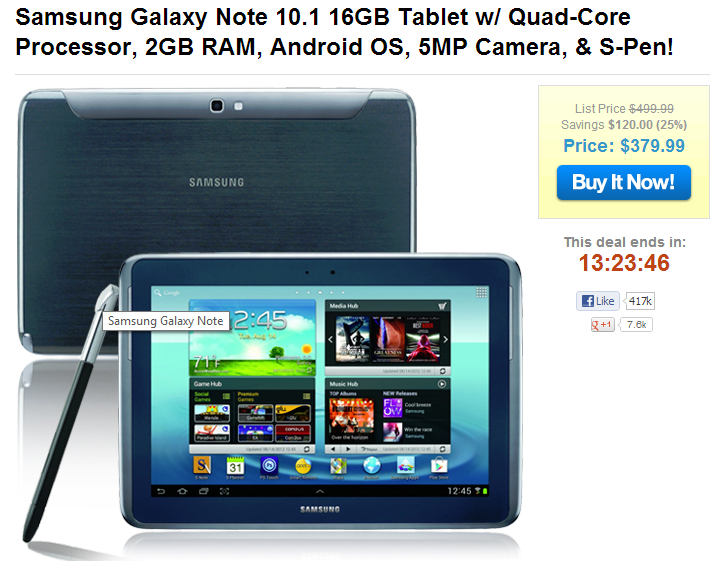 For today only, you can get a refurbished Galaxy Note 10.1 16GB for $380. That's a solid $120 off the retail price, which makes for some pretty nice savings. Comparison shoppers will find the same tablet for $429.99 at Best Buy and the lowest price we could find otherwise: $399.99 at Walmart. As we said, this deal ends later today, so hit the link below before you miss out.